"And when I am lifted up from the earth, I will draw all people to myself." 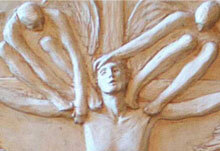 The Gospel of John was the inspiration for a series of reliefs and sculptures made over the last ten years. Deborah Luke’s journey as a sculptor began in 1971 at Dominican College in New Orleans. There she studied with noted Louisiana sculptor Angela Gregory, a student of Antoine Bourdelle, considered the most accomplished student of Auguste Rodin.